The Demolition Area 1 (Demo 1) site is a naturally formed 7.4-acre, 45-foot deep topographical depression (or kettle hole) located on Camp Edwards approximately two miles northeast of the Otis Rotary in Bourne. The site was used from the mid 1970s to late 1990s for training and disposal of items, including munitions, fireworks, small arms ammunition and explosives. Active remediation is in place to address the 9,000- x 1,000- x 100-foot groundwater plume of RDX and perchlorate contamination migrating west from the Demo 1 site. A comprehensive treatment system, which became operational in June 2007, is extracting and treating 1.5 million gallons of groundwater each day and returning it to the aquifer through a series of reinjection wells. This system is an expansion of an interim system that treated close to 500 million gallons of groundwater from the Demo 1 plume between September 2004 and June 2007. The new system uses a total of five extraction wells to pump groundwater through containers of ion exchange resin and granular activated carbon that remove perchlorate and RDX respectively. The containers are housed in a new 9,000-square-foot building and one modular treatment unit. Treated water is returned to the aquifer through four reinjection wells. This action is expected to restore groundwater to cleanup levels in approximately 11 years and groundwater contamination above cleanup levels is not expected to migrate off the installation with this remedy in place. The Decision Document detailing the Demo 1 groundwater remedial action was signed in November 2006. For full text of that document, click here. Recent investigations determined that the plume had traveled further than what was anticipated at the time of the 2006 Decision Document. Additional cleanup alternatives were considered to determine if further measures were needed to meet the cleanup timeframes projected in 2006. A Remedy Selection Plan for a supplemental alternative has been issued. Click here for more information. 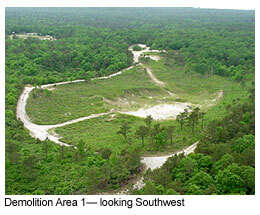 A source area response action also was completed at Demo 1 in 2004. More than 28,000 tons of soil were excavated to remove the continuing source of the groundwater contamination migrating from the site. The soil was treated on site using thermal desorption – a treatment method that uses heat to separate and breakdown contaminants in the soil – and used to backfill the Demo 1 excavations site, along with treated soil excavated to address the sources of several other areas of groundwater contamination. Based on these past remediation actions, the EPA has proposed to amend the groundwater Decision Document to include the Demolition Area 1 source area. The draft Addendum recommends no further action is necessary to address the source area due to the prior response action and the groundwater monitoring and treatment system already in place. For further information on the Addendum click here. To obtain more information about this site, click here. To view a map of the Demo 1 site and plume, click here. For information on where to find other documents related to this site and the program, click here.